A good turnout for the Bristol RC Raj Soni Memorial Hill Climb today up Cheddar Gorge, on bright sunny and calm day. Fastest up the 4km climb was Shaun Cook of Bristol RC in a fantastic time of 9:15, followed by James Phillips and Jon Tooby, who was also the fastest vet. 6th overall and Fastest Woman was Jenny Hudson in a very strong time of 10:41. Thanks to everyone who came out to support and to help with pushing off and timing and photography. It was a really good social occasion and much coffee was consumed at Cafe Gorge. The club will make a donation of the entry proceeds to the Raj K Soni Legacy Fund. The Hill Climb this year once again takes place up Cheddar Gorge on Saturday 20th October 2018. The race will start in the layby just up from Café Gorge on the other side of the road and finish at the top where we always turn left (B3371 junction). The plan is to incorporate it into the clubrun and leave BW Cycling at 8:45am, then get to Café Gorge in Cheddar for a 10.45am start. However you can always drive out if you want to. All Club members are encouraged to come and give it a go and see if they can beat the course record set in 2013 by Ben Davis in a time of 9:09. Friends of the club are also welcome to take part but please contact us to say you are coming along (email brian.okelly@bristolroadclub.com). Last year, Ross Phelps was the fastest rider up in 09:31 and Fiona Redding (now Russell) the fastest Woman in 11:05. We expect a very competitive event again this year. The entry fee is £3.00 on the line and a donation of proceeds will be made to the Raj K Soni Legacy Fund (www.rajksoni.org.uk). The first rider will be off at 10.45am and then following riders at intervals of one minute. Cheddar Gorge is a 3.5Km hill climb from the village of Cheddar up through the impressive rock of Cheddar Gorge to the top of the Mendips. Cheddar Gorge is about 15 miles South West of Bristol, just off the A 38. Climb from 50m to 210m – height gain of 160m. (from bottom of village is 20m) but climb proper begins as you start to exit the village. After a gentle climb through the village of Cheddar, the road begins a sharp rise through several hairpins cut into the rock face. Here there are sections of 16%. After 0.6mile, the gradient levels off and becomes a gentle 3-4% for another 2 miles to the summit. When racing it is important not to overcook it on initial steep section. A great turnout for the Bristol RC Raj Soni Memorial Hill Climb today up Cheddar Gorge, with some wind assistance and fast times. Fastest up the 4km Cheddar climb was Ross Phelps of Bristol RC, in full TT kit, who retained the Raj Soni Memorial Hill Climb Trophy, in a time of 9:31, some 45 seconds faster than last year. Second was a new Bristol RC rider, Gareth Hanahoe, showing great potential and beating Steve Thomas of Ride 24/7 into third place by just 3 seconds. Fastest Woman was Fiona Redding in a fantastic time of 11:05, more than a minute faster than her time last year beating first year BRC racer Ali Cameron by 25 seconds. Thanks to everyone for braving the weather and to Pete Deamer, Andrew Dade and Adam Maslen for doing pushing off and timing. The Hill Climb this year once again takes place up Cheddar Gorge on Saturday 21st October 2017. The race will start in the layby just up from Costa on the other side of the road and finish at the top where we always turn left (B3371 junction). Last year, Ross Phelps was the fastest Bristol RC rider up in 10:16 and will be defending his title. After a gentle climb through the village of Cheddar, the road begins a sharp rise through several hairpins cut into the rock face. Here there are sections of 16%. After 0.6mile, the gradient levels off and becomes a gentle 3-4% for another 2 miles to the summit. When racing it is important not to overcook it on the initial steep section. A great turnout for the Bristol RC Raj Soni Memorial Hill Climb today up Cheddar Gorge, on a cold day and into a headwind. Fastest up the 4km Cheddar climb was Ross Phelps of Bristol RC and winner of the Raj Soni Memorial Hill Climb Trophy, in a time of 10:16, beating Steve Thomas of Dream Cycling RT into second place by 29 seconds. Graham Reeves of Bristol RC was third, a further 13 seconds back. Best Woman was Fiona Redding in a very good time of 12:18 to take 10th place overall. Well done to everyone that took part and thanks to all those that came out to support and help. The club will make a donation of the entry proceeds to the Raj K Soni Legacy Fund. The Hill Climb this year once again takes place up Cheddar Gorge on Saturday 22nd October 2016. The race will start in the layby just up from Costa on the other side of the road and finish at the top where we always turn left (B3371 junction). The plan is to incorporate it into the clubrun and leave BW Cycling at 8.30am, then get to Costa at Cheddar for a 10.00am start or thereabouts. However you can always drive out if you want to. All Club members are encouraged to come and give it a go and see if they can beat the course record set in 2013 by Ben Davis in a time of 9:09. Last year, Graham Reeves was the fastest Bristol RC rider up in 9:47 and will be defending his title. The first rider will be off at 10.15am and then following riders at intervals of one minute. A very impressive turn out for the Bristol RC Raj Soni Memorial Hill Climb today on Cheddar with many club members and second claim members taking part. Fastest up the 4km Cheddar climb was Steve Brown of Dream Cycling RT in a fantastic time of 9:34, just beating teammate Steve Thomas into second place by 2 seconds. Graham Reeves of Bristol RC was third in 9:47 and wins the Raj Soni Memorial Hill Climb Trophy. Graham is a recent member of Bristol RC and has just started racing so shows enormous promise for 2016. Making up the Bristol RC Podium was Duncan Goodchild and Tom Brookes. Best Woman was Maddie Moore, just back from regaining her Masters World Track Champion medals in Manchester, closely followed by Gwen Bevan of Bristol RC only 3 seconds back. Best Junior was Sam Long. The Hill Climb this year once again takes place up Cheddar Gorge on Saturday 17th October 2015. The race will start in the layby just up from Costa on the other side of the road and finish at the top where we always turn left (B3371 junction). The plan is to incorporate it into the clubrun and leave BW Cycling at 8.30am, then get to Costa at Cheddar for a 10.00am start or thereabouts. However you can always drive out if you want to. All Club members are encouraged to come and give it a go and see if they can beat the course record set in 2013 by Ben Davis in a time of 9:09. Last year, Dominik Burchette was the fastest up in 10:26 and will be defending his title. We also expect Steve Thomas, winner in 2012 to be taking part. Dominik Burchette has won the Bristol RC Raj Soni Memorial Hill Climb in a fantastic time of 10:26, beating Richard Shortridge into second place just 14 secs back in 10:40. Jack Sawyer was third to round out the podium. Best Woman was Holly James (10th) and best Junior was Alex Yeo (4th), both racing in their first Hill Climb. Well done to everyone that took part and thanks to all those that came out to support and help. The club will make a donation of proceeds to the Raj K Soni Legacy Fund. The Hill Climb this year once again takes place up Cheddar Gorge on Saturday 11th October 2014. The race will start in the layby just up from Costa on the other side of the road and finish at the top where we always turn left (B3371 junction). The plan is to incorporate it into the clubrun and leave BW Cycling at 8.30am, then get to Costa at Cheddar for a 10.00am start or thereabouts. However you can always drive out if you want to. All Club members are encouraged to come and give it a go and see if they can beat the course record set last year by Ben Davis in a time of 9:09. Ben Davis has won the Raj Soni Memorial Hill Climb in an amazing time of 9:09, beating last year's winner Steve Thomas into second place also with a fantastic time of 9:31. Go check on your Strava to see how close you can get to these guys. Best Woman was Ellen Nelissen and best Junior was Tom Lear, both racing for the first time. 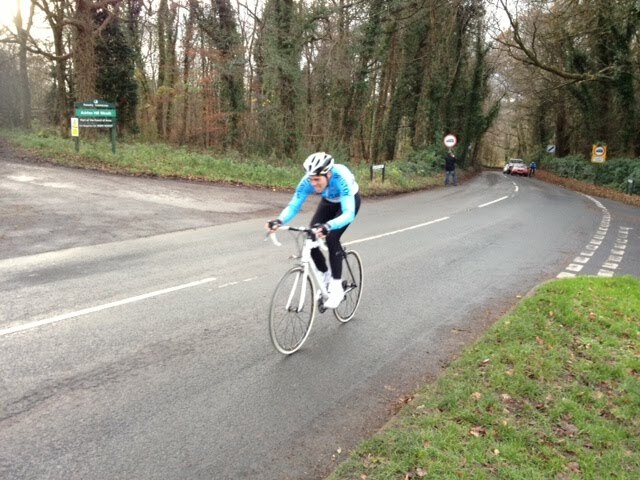 Steve Thomas has won the Raj Soni Memorial Hill Climb with a stunning ride to beat Matt Franklin by 20 secs. Sunday 14th October was a fine day on Cheddar Gorge and everyone met in Costa at the bottom of the climb, most riding out to the event. We had 17 starters with as many supporters out to watch and cheer. Eveyone was very aware of the meaning of the event this year, in the memory of young Raj Soni, who was tragically killed in July this year in a riding accident. Raj loved this climb and would have been challenging Steve closely that's for sure. Bristol RC now have a fabulous new cup for this event which will be presented to Steve Thomas at the Annual Dinner on 24 November 2012. We expect the Hill Climb to grow in stature over the next few years and entries to increase dramatically next year now that we have established it on Cheddar Gorge. We will announce the date for 2013 on this page, but it will be sometime in October, so check back here for details. Steve Thomas on the way to a fantastic win and a time to challenge the best! Matt Franklin was best in the HIll Climb with a fantastic ride up Belmont Hill in a time of 4mins 4 secs, beating Ben Hall in to second place, just 10 seconds behind and then Kevin Jones a further 16 seconds back. 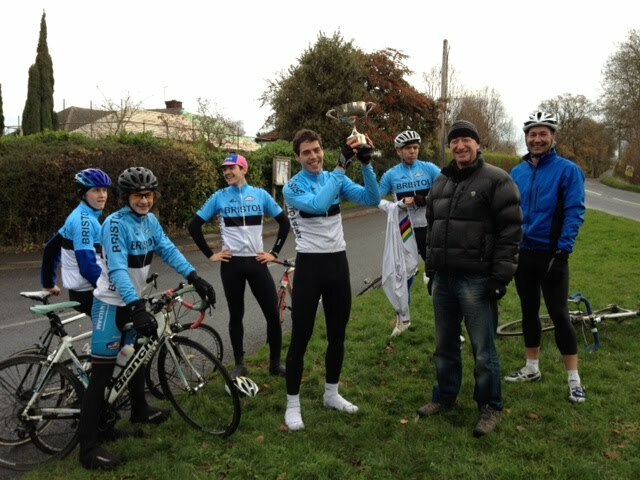 The youngest member of the club, Jack Sawyer, riding his first ever race, let alone hill climb rode brilliantly shaking off some tired legs from the saturday club run, while Jason White emerged from retirement to hopefully build up for a new season in 2012. This will be open to full and second claim Club Members as priority, then restricted to a maximum of 40 riders. The entry fee is £2. 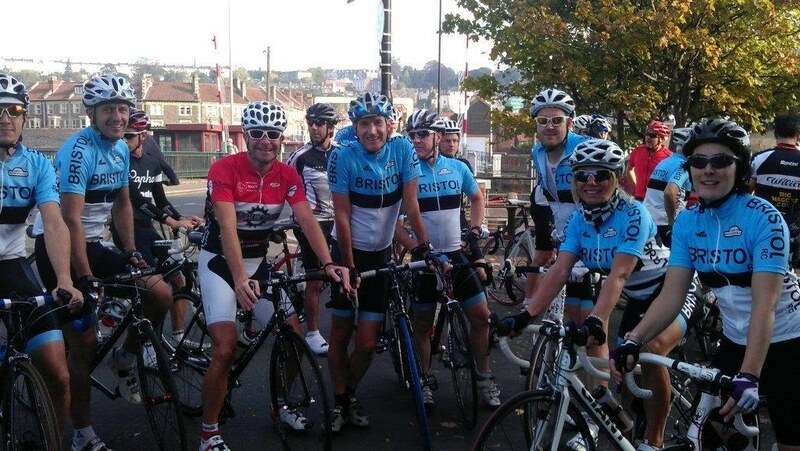 Winner will be awarded the Bristol RC Hill Climb Trophy (only Full Club Members eligible). Meet at top of hill on right where there is an open area for parking. Get there for 9am.